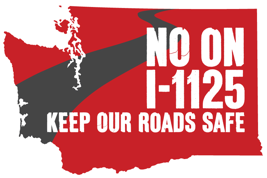 It's neck and neck, so here are some more reasons you should vote no on I-1125. Assuming you haven't already. I-1125: A recipe for gridlock According to Eyman, if I-1125 passes it would kill the voter-approved plan to build light rail across Lake Washington on the I-90 floating bridge.That alone would create gridlock and hurt our economy-making it impossible for local businesses to get around and discouraging new business from opening in the Puget Sound region. Currently, an independent, non-partisan commission sets toll rates in the state. I-1125 would take toll rates out of the hands of that independent commission and turn it over to the state legislature.That will cost taxpayers hundreds of millions in increased bonding costs, according to an independent analysis for the State Treasurer.The idea of a legislator from Seattle setting toll rates in Eastern Washington or having a politician in Walla Walla determining important transportation policies in the Puget Sound area makes no sense -- that’s why no other state in the country lets politicians set toll rates. This isn’t the first time that Eyman has sponsored a measure aimed at changing transportation policy and creating more gridlock. In recent years, several Eyman-backed transportation measures have either been defeated at the polls or thrown out by the courts because they are poorly written or aren’t constitutional. Eyman has received the bulk of his contributions for I-1125, over $1 million, from a single donor, a wealthy developer. Who is opposed to I-1125? The health of our communities and the health of our economy relies on good transportation policy that keeps people moving. I-1125 threatens to create gridlock around the state, damaging our quality of life and our economy.That’s why transportation planners across the state and a nearly unprecedented coalition of business, labor, environmental and community leaders have come together to oppose Initiative 1125 under the banner of Keep Washington Rolling.